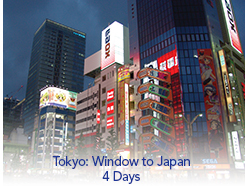 Tokyo is Japan's capital and the world's most populous city. A glamorous, world-class metropolis, Tokyo offers an unlimited choice of shopping, cultural attractions, entertainment and fabulous dining. Historic temples, inspiring gardens and great museums dot the city. Magnificent Mount Fuji and Lake Ashi are included with a ride on the Hakone Ropeway, the longest cable car system in Japan and the second longest in the world.